Win prizes and share the goods! Ellen DeGeneres invites fans to enter the Cheerios One Million Acts of Good Giveaway online at ellentube.com/cheerios for a chance to instantly win shareable prizes. More than 4,000 prizes are up for grabs. Over $50,000 in prizes. Plus, one lucky grand prize winner will win a trip for two to Los Angeles, CA to attend a taping of The Ellen DeGeneres Show. Collect special codes to get started. 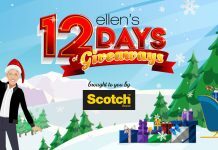 The Ellen And Cheerios One Million Acts of Good Giveaway is a new Sweepstakes sponsored by General Mills. The Promotion is open only to legal residents of the 50 United States (including District of Columbia). Entrants must be at least 18 years old at the time of entry. The Sweepstakes and the Instant Win Game begins on January 1, 2018 at 12:00 a.m. ET and ends on May 31, 2018 at 11:59 p.m. ET. Each entrant may receive one Sweepstakes entry per day and one Instant Win Game play per day during the Promotion Period. Once you have a Code, visit ellentube.com/cheerios and complete and submit the registration form including your Code. You automatically will receive one entry into the Sweepstakes and advance to the Instant Win Game page and receive one Instant Win Game play for that day. Game. The Instant Win Game results will be instantly displayed. For complete details and official rules, visit onemillionactsofgood.cheerios.com. 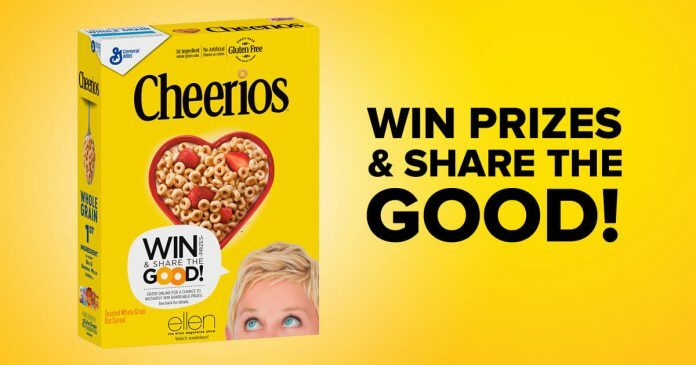 Next articleHow To Obtain Ellen and Cheerios One Million Acts of Good Codes?